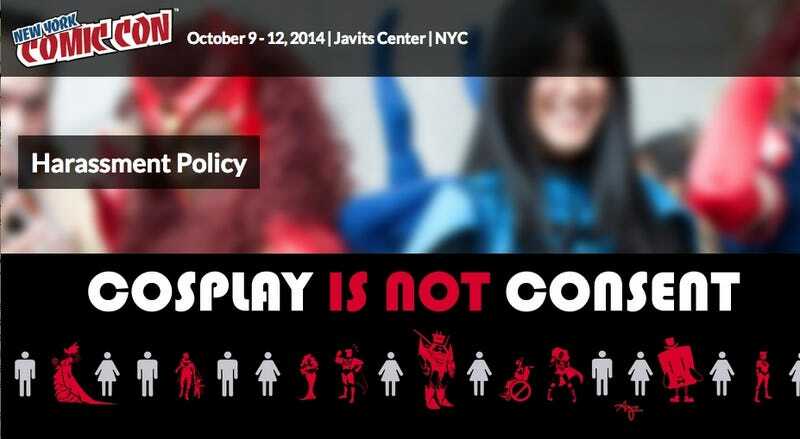 Attendees at this week's New York Comic Con have been pleasantly greeted with large and clear signs that declare "Cosplay Is Not Consent" and ask individuals to refrain from touching or photographing others without asking first. Please keep your hands to yourself. If you would like to take a picture with or of another NYCC fan, always ask first and respect that person's right to say no. When at New York Comic Con, be respectful, be nice, be cool and be kind to each other. NYCC has additional signage up that explains that they're enforcing a detailed "zero-tolerance policy" for harassment of any kind. There's also an easy way to report harassment via the NYCC app. The signs come after the same conversation was stirred up during San Diego Comic Con, and there's been a lot of positive feedback about them on Twitter.